Every major index ETF remains overbought headed into the open. Small caps continue to lead the group with the Core S&P Small Cap (IJR) having risen the most over the past week at 4.08%. The Micro-Cap (IWC) is right on IJR’s heels with a gain of 4.03%. Both ETFs are also the most overbought and among the highest above their 50-DMAs (IWM Russell 2000 is the highest above its moving average). On the other hand, large caps have continued to lag behind their smaller peers as they have much of the year. While gains over the past week have been somewhat middling, the S&P 100 (OEF) is currently the only index to not have seen double-digit gains since the start of the year. The other large-cap index, the Dow (DIA), has managed to edge out returns more in line with the other major indices at 10.98% YTD. 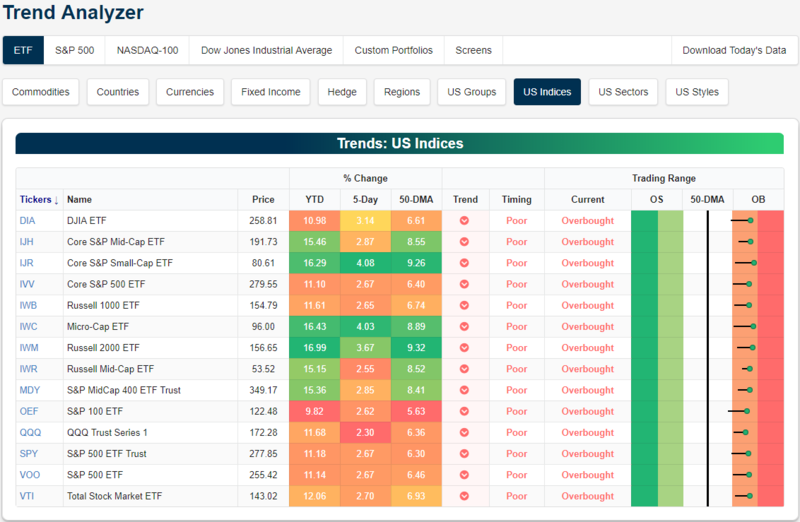 Looking at the 11 sectors of the economy, every ETF tracking the individual sectors is now also overbought. This time last week, a number of these sectors were still neutral. Industrials (XLI) is currently the most overbought as it sits 10.2% above its 50-DMA. XLI has also seen the best returns gaining 17.47% YTD. As the best performer over the past week (+5%), Energy (XLE) is next in line in YTD terms adding 15.64%. 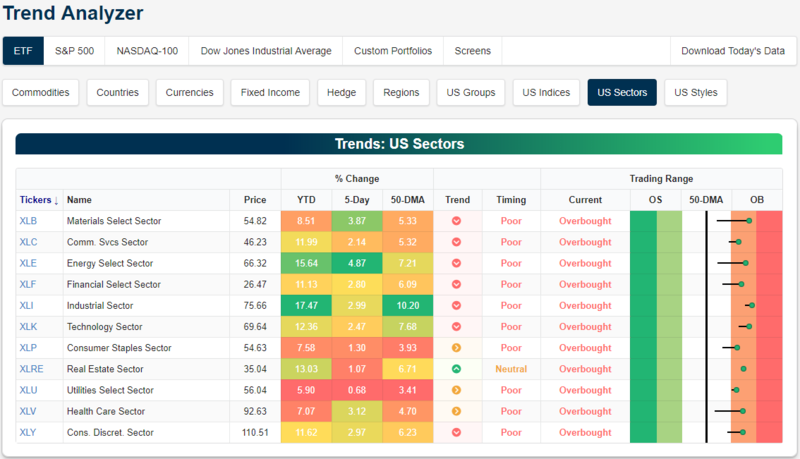 A major positive development to note when looking at the sectors is that in the past month, trends have begun to reverse whereas every sector was firmly in a downtrend at the beginning of the year. Real Estate (XRE) is currently the only one in an uptrend. Three others (XLP, XLU, and XLV) are now trending sideways.